A skilled listener can attend to difficult emotions with empathy and provide a safe space for emotional support. Being truly heard and understood is the foundation for establishing trust. 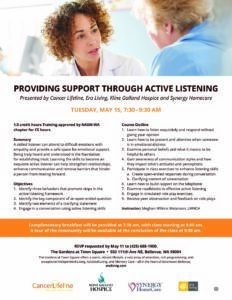 Learning the skills to become an exquisite active listener can help strengthen relationships, enhance communication and remove barriers that hinder a person from moving forward.